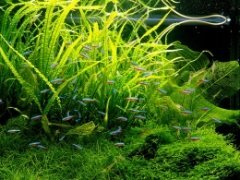 Aquascaping news, guidance, and tips for aquascaping freshwater planted aquariums. 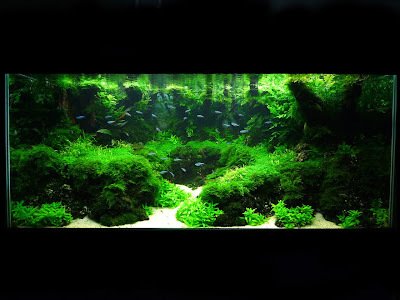 The aquascaping contest results season is here, and hot on the heels of the IAPLC top 27 video is the results from CAPA, a French aquascaping contest (not quite sure what the acronym stands for, but I'd guess one of the A's is aquascaping). There are some repeats from the IAPLC 2009 top 27 results, but there are also some very nice tanks that we haven't seen yet (like the one above, I love the depth!). Like the AGA aquascaping contest, the CAPA is divided by tank size, so each class has a set of winners. You can view the top 3 of all classes, the Under 70L category, the 70-250L category, and the Over 250L category. Plenty of great aquascapes to spark your imagination! AGA 2009 results are in. Copyright 2009-2012 © All rights reserved. Aquatic-Eden is an Amazon.com affiliate. Simple theme. Theme images by TommyIX. Powered by Blogger.